MUMBAI: A Sudhir Mishra film Daas Dev is sure to make a lot of noise as the makers seem to twist the plot in the most unique way. One would try relating this movie with the 2002 Devdaas but Daas Dev movie is set beyond your expectations. Recently the makers of this film have launched a rap track Daasdev, depicting the situations in Rahul Bhatt’s life. 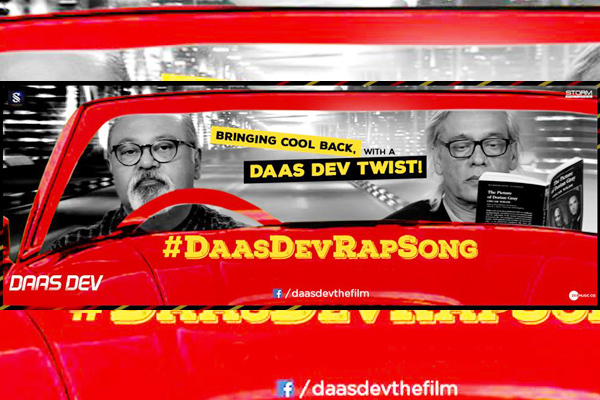 The song grabs attention with its funky rap explaining the characters of the movie Daas Dev and the story in a peculiar way. One would also witness actor-director duo Sudhir Mishra and Saurabh Shukla featuring in the track. The track witness a range of fictional scenes with black and white visuals with tinge of red crafted out beautifully. Apt music given to the track with a blend of English and Hindi rap has worked well. Daas Dev features Rahul Bhat as Dev, Richa Chadha as Paro, Aditi Rao Hyderi as Chandni. In step with the lead cast is Saurabh Shukhla in one of the most complex roles of his career. Further cast includes Vipin Sharma, Dalip Tahil, Deep Raj Rana, Anil Sharma and Sohaila Kapoor. Also, Anurag Kashyap and Vineet Singh will be seen as special appearances in the film. Daas Dev, a Sudhir Mishra film produced by Sanjeev Kumar of Saptarishi Cinevision and presented by Gaurav Sharma of Storm Pictures is slated to release worldwide on the 20 of April. MUMBAI: Right now India is captured with the frenzy of Lok Sabha Elections 2019. The ongoing voting is divided in phases and the financial capital of India, Mumbai will vote on 29 April 2019. Every candidate is trying his best to campaign himself/herself in the best possible way. MUMBAI: "Oh God, one more remix?" Karan Johar rightfully asks in the reboot version of Aankh Marey in Simmba.